Yes Ladies and Gentleman, you did read that title correctly. 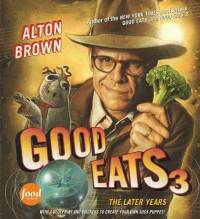 I said Alton Brown; and I am going to see him in less than two weeks! He is coming with Rainy Day books to the Unity Temple on the plaza. He is going to talk about his new book, "Good Eats: The Later Years." I am so excited that I can barely contain it. I'm actually going to be meeting one of the most influential man in my cooking experience. (Check out my first post -What I'm all about) After watching and studying everything he has taught to the viewers of Good Eats, I have discovered a new respect and passion for food. Three times every day we have the opportunity to take our mouths on an adventure with flavors from all over the world. So, why waste any meal on the same plain old boring when it can be exciting and different? I will be sure to take notes when I go to see him and share them all with you. Check back in a few weeks to hear all about it!